방비엥, 라오스의 이지 고 호스텔 | 호스텔월드에서 예약하세요. Welcome to Vang Vieng and welcome to Easy Go! We are a family run hostel that focuses on making people feel welcome and included just like they would be at home! We even have puppies and kittens for you to play with! mountain view balcony whilst watching some nature programs listening to chilled music in the morning before joining the hostel on one of its group run activities everyday. 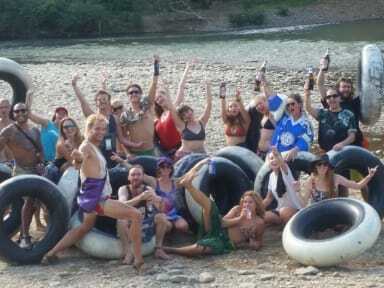 There is so much to do In Vang Vieng, whether its going tubing, visiting one of the caves or lagoons, driving motorbikes to waterfalls or just chilling by the river and that's all without talking about the great nightlife on offer! We are 2 minutes away from the main strip which means we are centrally located whilst still being quiet enough to sleep after a good nights party! As well as the group activities on offer we also have lots to do whilst chilling at the hostel, We have over 3000 movies and TV series and making new friends! We have 2 hostel dogs and 2 cats who are always wanting to play or curl up and sleep on your stomach. This is a perfect place to meet people from all over the world, whether you're traveling alone or with a group, everyone can find amazing people to share amazing stories. With both local and western staff we like to think we offer the best of both worlds within a budget setting. We have 2 Pool Tables, free Wi-Fi, a bookshelf full of books to choose from or exchange, complimentary tea or coffee in the morning as well as a cheap bar and kitchen to help you relax and enjoy yourself. Even if you are not staying feel free to come and chill with us and find out why its so hard to leave Easy Go :). We also have a bus and tour service that will pick you up from the hostel as well to make your onward travels easier. We always save a few beds for walk ins as well.